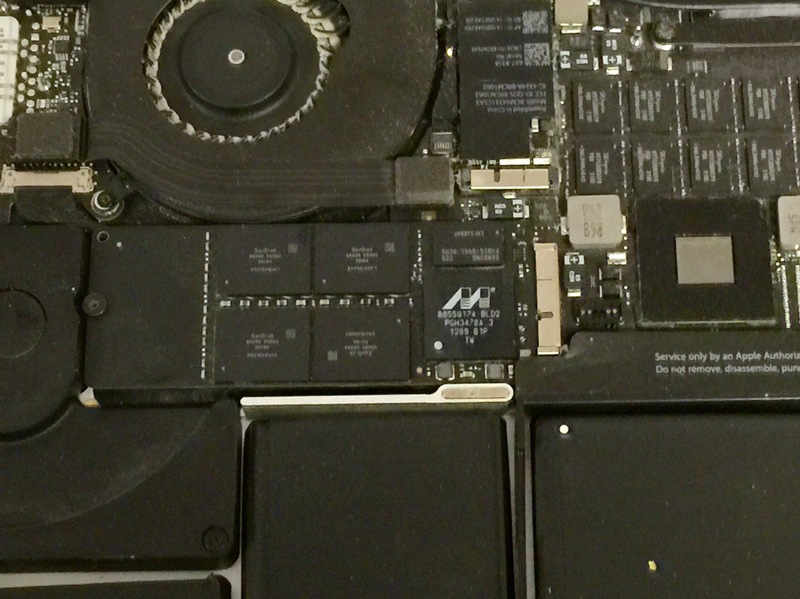 Today I’m going to show you how to install a new SSD in your Retina MacBook Pro. 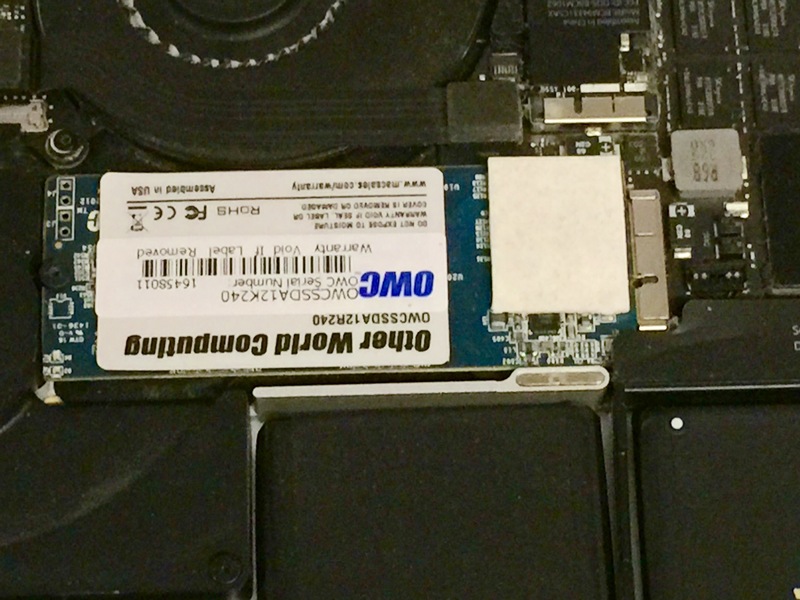 Adding a new SSD can give you internal speeds and storage capacities beyond what Apple provides. 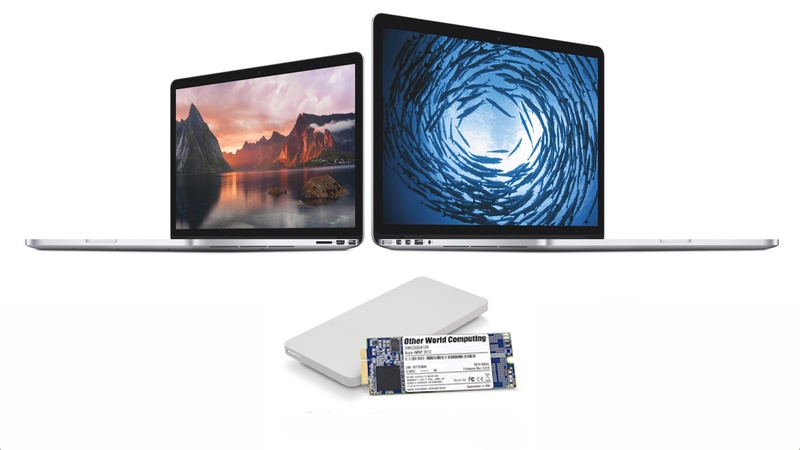 This works with the 2012 and 2013 MacBook Pros with the identifier of MacBookPro10,1 for the 15″ and MacBookPro10,2 for the smaller 13″ with a SATA based SSD. 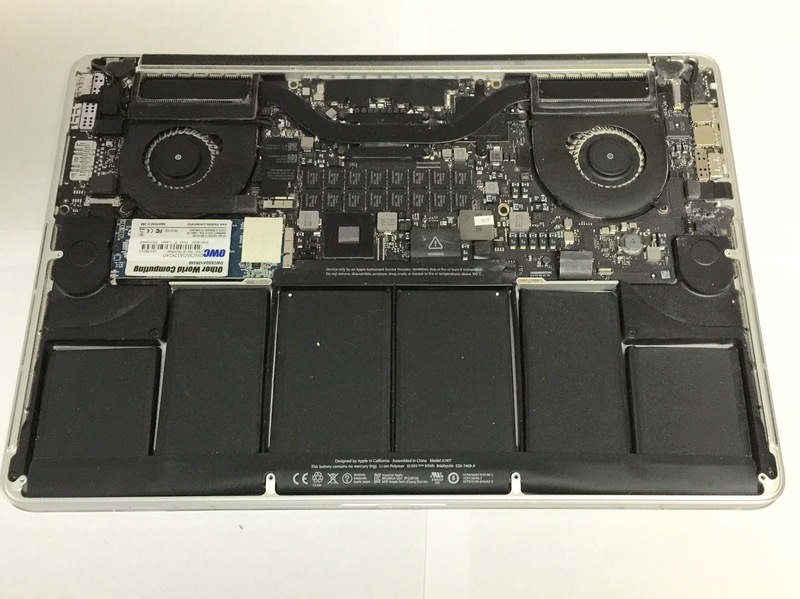 Newer Thunderbolt 2 MacBook Pros use a PCI-E SSD, which while would use the same process, do not yet have a replacement part available. 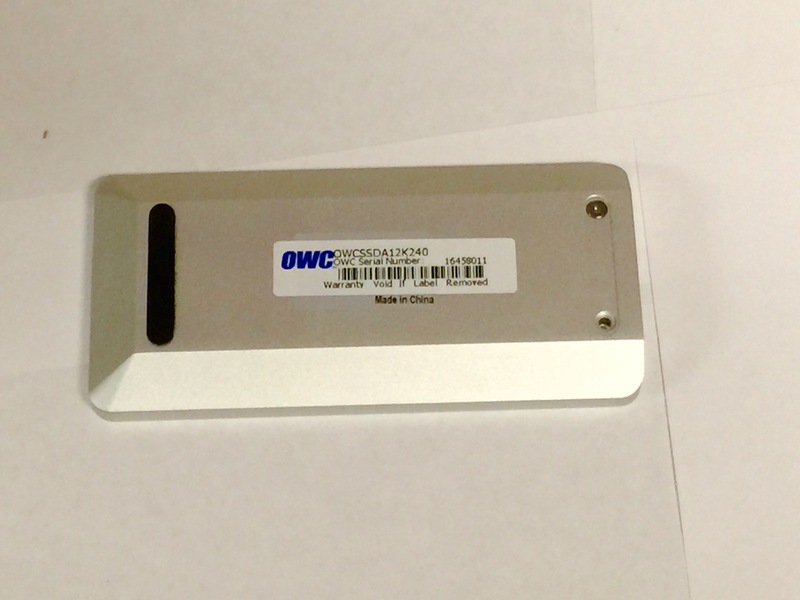 The drive we are using today is a OWC Aura for the MacBook Pro that has been provided by the company. However, this guide is applicable for any compatible third party SSD drive. 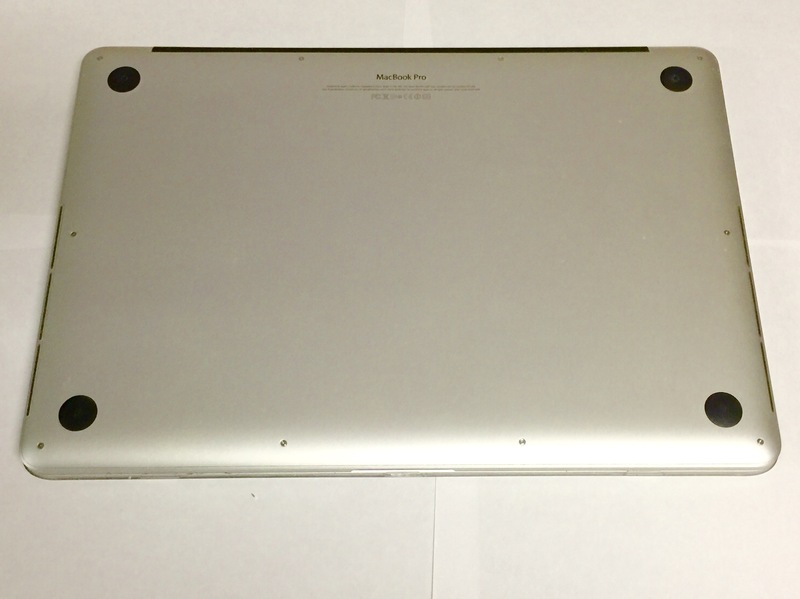 The MacBook Air also uses a very similar process. 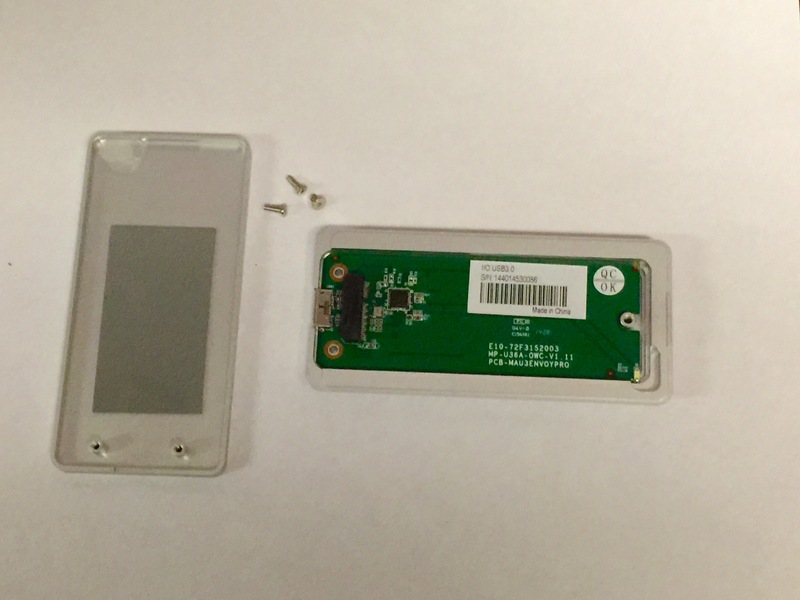 Also be advised that while this is a simple process, any damaged cause by the use or installation of third party SSDs are not covered by AppleCare. This installation is not advised for anyone not comfortable working on computers or electronics. 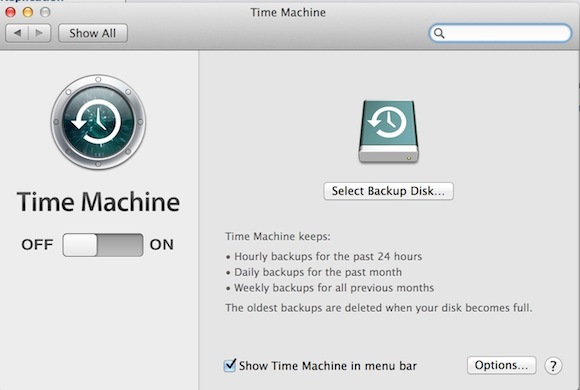 Whether its Time Machine or a third-party solution, make sure all your data is backed up to another drive or server… or two or three. DO NOT start unless you have all your data on your internal SSD backed up. Even if it takes a while, you can afford to wait. This step is technically optional, but prefer to have my drive cloned and setup before installing it in my computer. You can also clone the drive after installation. Also, make sure your workspace is clean and free from any metal devices while working with drives. Take the USB 3.0 enclosure and slide it open. Remove the new SSD from the static bag. Insert it into the SATA connector, it should easily install with little to no effort. 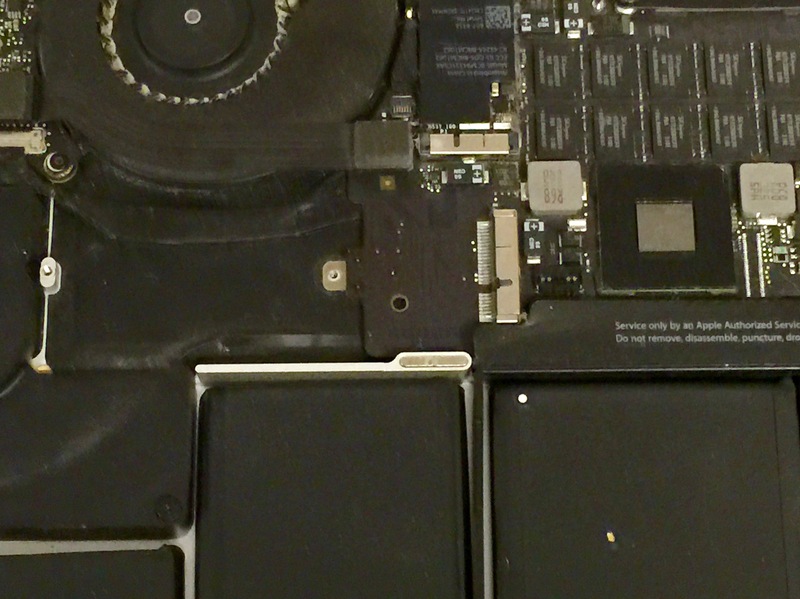 Take the included short T5 screw and install it into the screw hole at the end of the SSD. Make sure it is secure, but don’t over tighten it. Now slide the cover back on. Install the two larger T5 screws at the end of enclosure. The drive is now installed. You can now insert the USB 3.0 cable and plug it into your Mac. You now need to get your data to the new drive. The easiest way to do this is by cloning your drive. 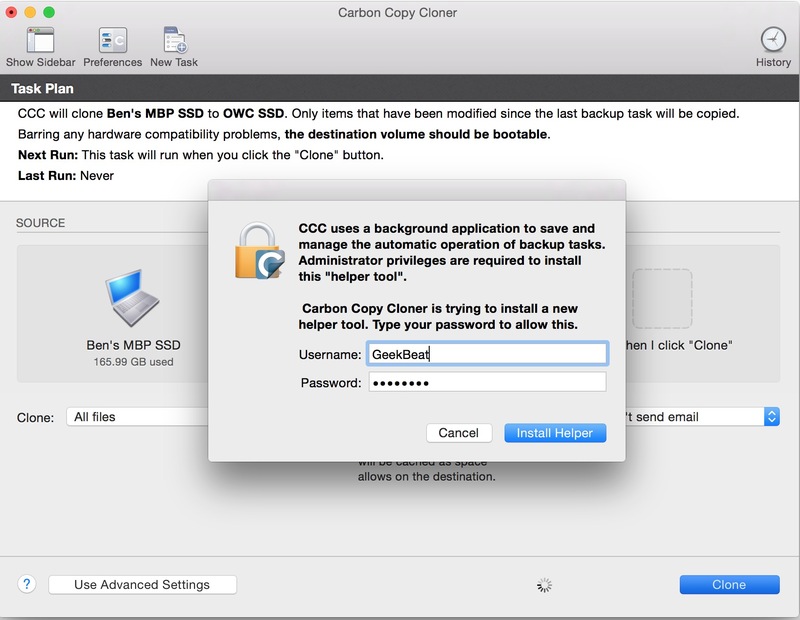 While you can do this with Disk Utility, I highly recommend a shareware utility called Carbon Copy Cloner. 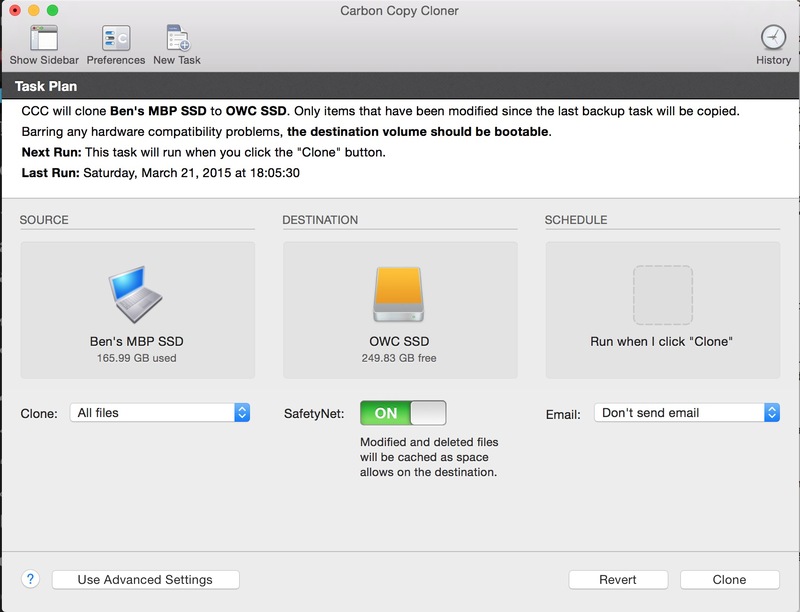 While this is a powerful backup utility, it makes cloning a drive easy. You may be asked if you want to purchase Carbon Copy Cloner or use this software as a 30-day trial. While, like SuperDuper!, it is definitely worth paying for, you can use the free trial for cloning this drive. 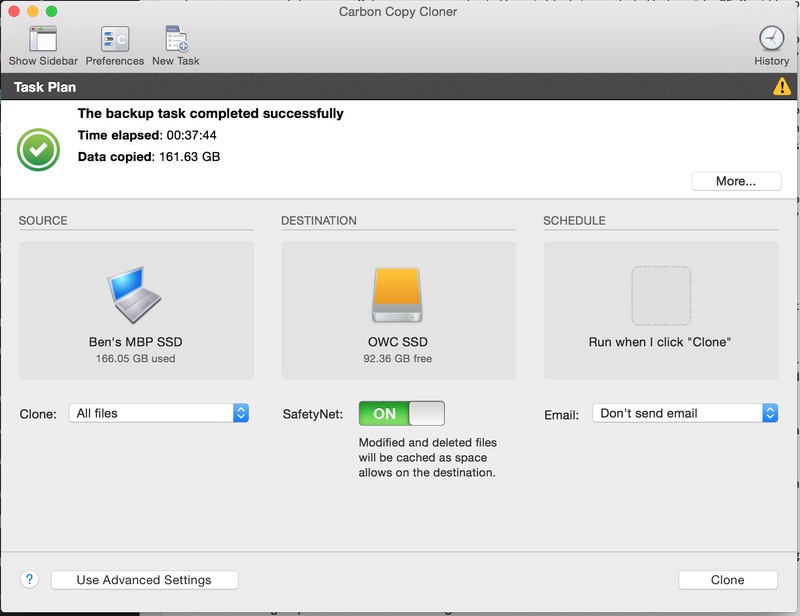 I highly recommend using Carbon Copy Cloner over other methods because it checks for the OS X Recovery Partition and installs it if it’s not present of the disk. The recovery partition takes the place of your OS x Boot CD in newer MacBooks that don’t have an optical drive. If you don’t have a recovery partition, your Mac would need a bootable copy of OS X on another disk to be able to recovery from an issue with the OS. Your first step is to choose your Source drive. 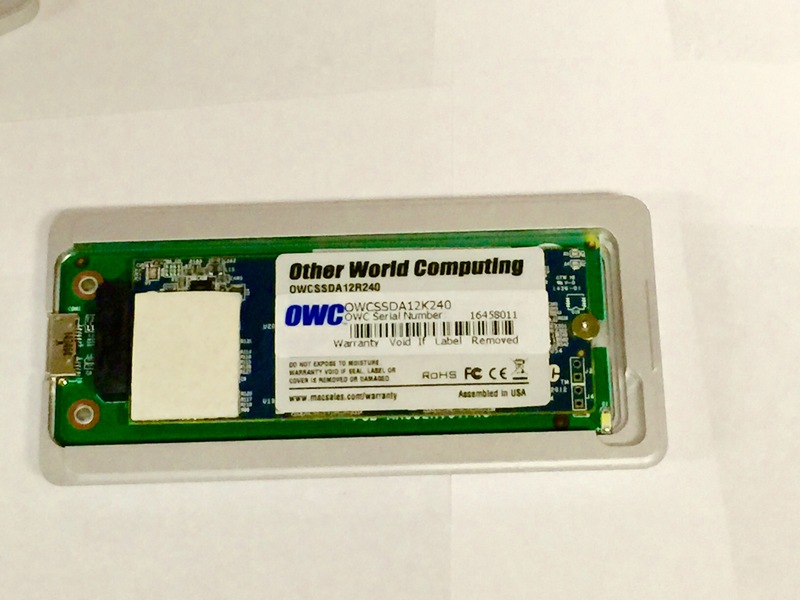 This will be your original internal SSD. Now Click on your Destination, this will be your new drive. There is a schedule box, but you don’t have to worry about this. Click on Clone. You’ll now be asked if you want to install a helper tool. Put into your administrator login and click on Install Helper. Now wait for the drive to clone. This may take up to half an hour or more. Once done, it will tell you the task has been completed. You now quit Carbon Copy Cloner. Turn your MacBook upside down and place it on your work area. There are 10 Pentalobe screws holding the bottom plate on. On screw them and keep them in a safe place. They are small and easy to lose. Remove the bottom cover and place it out of the way. If its dirty and you have a cloth, you should take this time to clean the dust off the panel. Now gently unhook the battery connector. Its beneath a triangle warning symbol. Once dislodged, pull the connector up slightly so it won’t reconnect while you’re working. 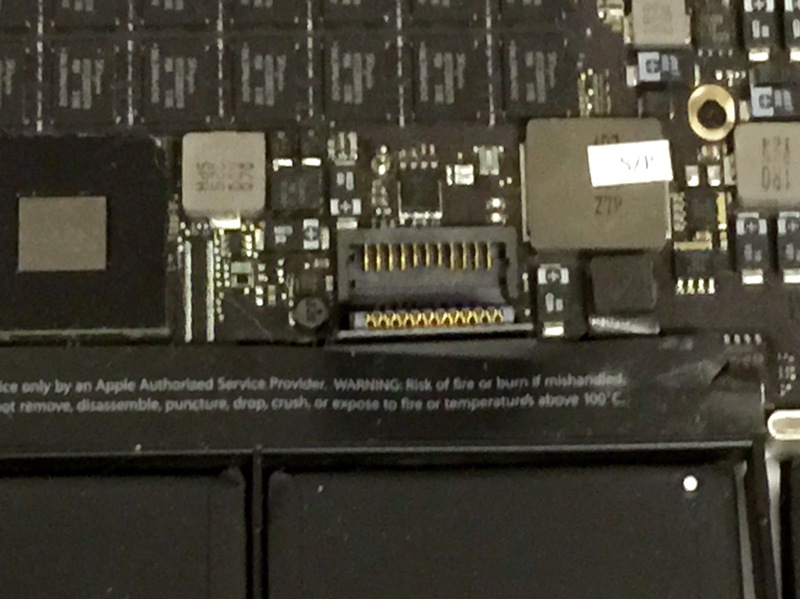 Unscrew the single pentalobe screw holding in the SSD. Remove the old SSD and insert the new one. 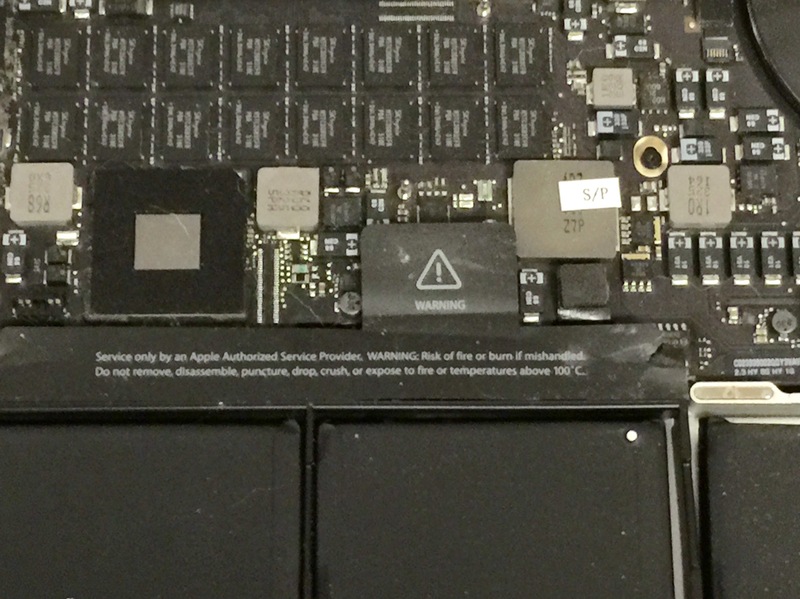 That may include removing the new SSD from the enclosure. Place the old SSD in either the enclosure or the static free bag. 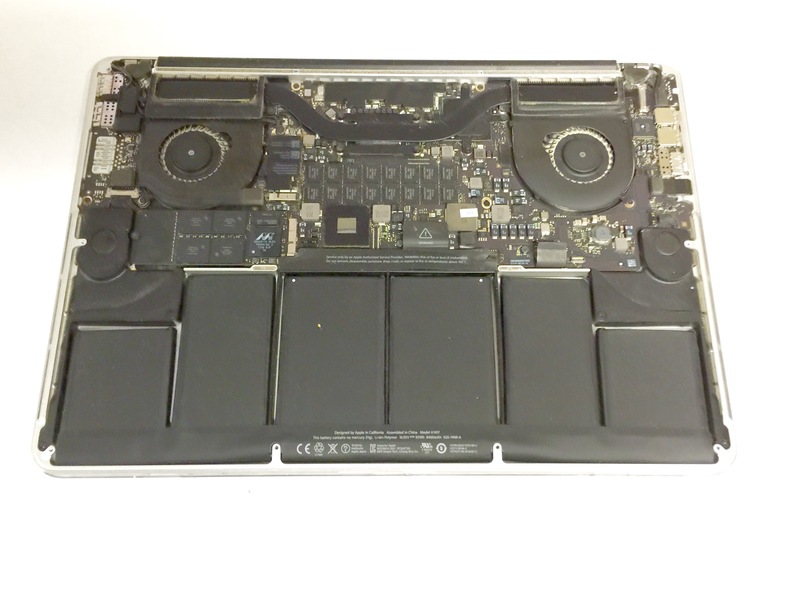 Now replace the screw and plug back in the battery connector. Now replace the bottom panel and its 10 screws. Turn it back over and restart the Mac. If it starts regularly, you’re done. You may have to reset a couple settings, but given the clone of the hard drive, it should behave exactly like it did before, only a bit faster and with more storage if you went with a larger SSD. Now you’ve upgraded your MacBook Pro with a new and faster MacBook Pro.